Use the Door Mount Grid for postural assessments in your office. The grid takes no floor space and easily mounts to any door. The door mount grid measures approx. 26” x 78”. The grid easily mounts to any door using tacks, screws or double-sided tape. Text and lines are printed in blue. The material is a durable translucent white flexible plastic material. Visually assess posture, and document your findings by taking a quick digital photograph. The grid may be cleaned easily with a soft sponge and dish soap, so it always looks good! Great for the office as it takes zero floor space! You can also teach Wall Protocol StrongPosture Exercises against it – and wipe clean. The door mount grid is the perfect assessment solution for tight areas, and offices with limited wall space. A picture is worth a thousand words, and posture pictures provide compelling visual evidence for patients and clients as well as providing important data for tracking posture changes and choosing appropriate posture exercise rehab protocol. The horizontal and vertical lines make posture deviations easy to identify and explain to patients, plus pre- & post- posture analysis pictures makes it easy to demonstrate increased symmetry and other changes. 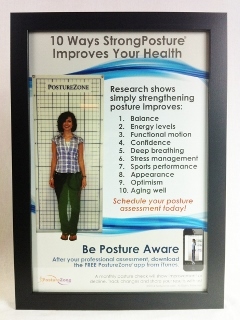 PostureZone Grids are the number one posture grid on the market and is used by posture professionals; chiropractors, physical therapists, physiotherapists, massage therapists, dentists, Oro Facial Myologists, personal and fitness trainers, Pilates and yoga instructors, coaches, Alexander Technique and Feldenkrais practitioners, hospitals, researchers, athletic teams, clinics, colleges and universities internationally. Love it. Just bought another. Have one for one treatment room. Just bought a second one. Have had both the door mounted and the free standing. By far, this is the higher quality. Is very heavy, needs multiple points of mounting but we were able to do with several heavy duty push pins. Judith Dember-Paige certified OroFacial Myologist gives this posture grid a thumbs up!! Got this for my chiropractic office - 2nd grid from this company. Fits on my massage therapy room closet door. Thanks for the free poster. Hope to add screenings as a service for my clients. Note: Make sure you use a level - took me twice to get it right. Ordered this grid for posture month screening and it's better than described. Very durable. I'm pleased with the purchase and quick shipment. Your charts have covered the walls in our treatment rooms for three or four years and I was inspired to write after observing yet another patient standing in front of them, reading and performing the maneuvers on them a few minutes ago. They absolutely love them and they all say that they make logical sense. This also leads to better discussions about body mechanics, adaptation, etc. The new grid looks fantastic! Sharp, clean. Very light-weight. Perfect fit for the front or back of a door. Clean, useful graphics. Click the button below to add the Posture Grid – Door Mount to your wish list.